Take a look at the official medals tally of the Asian Games 2018 right here. That's all from the live coverage from the Kurash mat for today. Stay tuned to Sportskeeda for all the live updates from the Asian Games 2018 from Jakarta-Palembang. 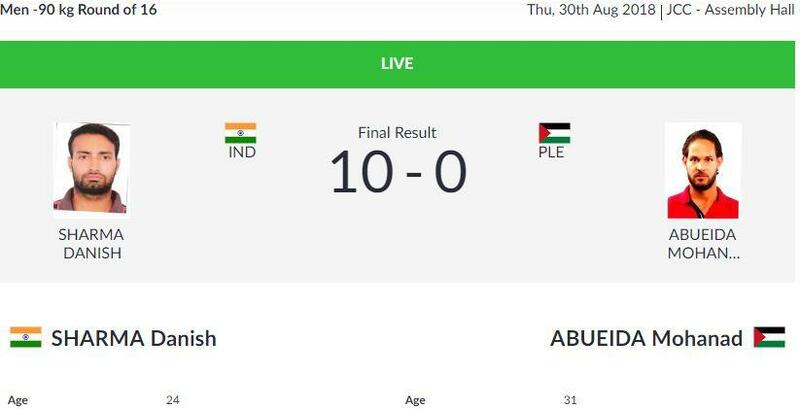 This loss means that all of India's competitors have been knocked out from the Men's Kurash under 90kg and Women's Kurash under 78kg category. Official scorecard from the quarterfinal clash in Men's Kurash Under 90 kg category. We have the results!! Danish Sharma has lost out to Husein Misri with a 10-0 as the refs ruled in the Kuwaiti's favor. A good throw sees the two fighters go to the ground and a Halal is scored but the refs are deliberating as to who gets the win. The two grapplers go at it quickly from the start and an intense battle is on our hands. The bout has begun in the Men's quarterfinal as Danish Sharma is in action. Thus, out of the four athletes in action today, only one - Danish Sharma has managed to cross the Round of 16. He will take on Husein Misri from Kuwait in the quarterfinals. Divesh from India is knocked out by Imamov in the Round of 16 of Men's Kurash Under 90kg category. Imamov executes a superb leg trip as he scores the second Yambosh. Two Yambosh equals a Halal and the bout is called to an end by the referee. Imamov scores a Yambosh early on and has a huge advantage now as Divesh scrambles to overcome the deficit. The bout is underway now as the two grapplers are locked in at an early stage. India's Divesh will be up against Uzbekistan's Yakhyo Imamov in the Men's Kurash Under 90kg category. The end of the match as Danish Sharma enters the quarterfinals of the Men's under 90kg category with a 10-0 win. Final minute of the bout as Danish Sharma hopes to defend his lead in the match. Just over two minutes to go in the bout as the Indian has the advantage in the match right now. Danish has done superbly well to score two Chalas to his credit and the Palestinian is penalised once by the referee. Danish attempts a over-the-shoulder throw but is unable to complete the move as the ref brings them to the centre for a restart. The bout is underway as the two grapplers go at it from the start with intensity. Men's Round of 16 action up next as India's Danish Sharma takes on Mohanad Abuieda from Palestine. Official scorecard from Amisha Tokas's loss in the Round of 16 of the Women's Kurash 78kg category. That's it!! The bout has ended and Vietnam's Thi Lan Nguyen has won it comfortably and Amisha Tokas is knocked out in the Round of 16. Nguyen scores a Chala to take a sizeable lead in the match. Final minute to play as the Indian Amisha Tokas tries to cover the gap in the match. However, the Vietnamese fighter scores a Yambosh, which is at a higher level than the Chala. Amisha Tokas gets one Chala to her credit and is leading now in the match. The bout has started as the two fighters measure each other up in the initial exchanges. Up next in the Women's Kurash 78kg category, we will have Amisha Tokas take on Thi Lan Nguyen from Vietnam. Mariya Lohova has emerged victorious over Jyoti Tokas as the Turkmenistan player scored a Halal, which ended the bout right there and then. Mariya Lohova wins 10-0 over Jyoti Tokas. Final minute of the match as Jyoti Tokas has to give it all to score a Chala or Maria will win it. The second half of the match is underway as the two go at it again in the corner of the mat. Mariya has been awarded a point for a Chala whereas a penalty point is given to Jyoti. Mariya tries to lock a leg hold on Jyoti but good defence from the youngster to keep her opponent at bay. And here we go, the bout has started now and within three minutes, we will know the winner. Jyoti Tokas is back on the mat again for her Round of 16 clash with Mariya Lohova from Turkmenistan in the Women's 78kg category. India's Danish Sharma beats Muhammad Alfais from Indonesia with a 3-0 score to enter the Round of 16. Danish Sharma clinches it!! He has beaten Muhammad Alfais from Indonesia to secure his place in the Round of 16. The end of the tie as the ref decide who won the tie. Sharma is awarded another point for his effort as he keeps battling the tall Indonesian Alfais with great grit. The Indonesian opponent has a huge height advantage but Danish is doing well to keep him at check. Sharma scores one point as we have just under three minutes of action left in the match. We're underway in the bout as Danish Sharma battles for a spot in the next round. The next Indian in action will be in the Men's 90 kg as Danish Sharma faces Muhammad Alfais from Indonesia. She's done it! Jyoti Tokas has won her bout in the Round of 32 with a 1-0 lead and progresses to the next round. And it's over!! We wait for the ref's decision now. Final twenty seconds in the tie as the two fighters tie their robes and go at it again on the ref's signal.